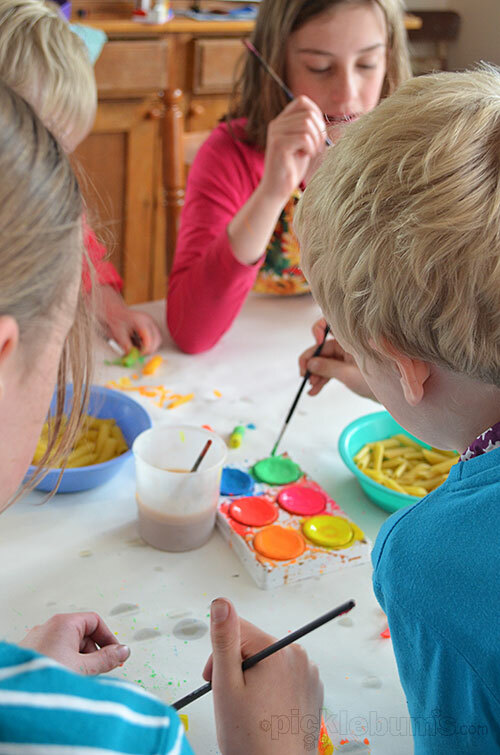 There are a few ways to colour pasta so that you can play or create with it, but I needed a quick and instant activity so I decided to let my kids colour the pasta themselves and we gave painting pasta a try. 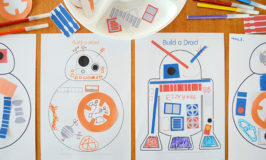 Turns out this was one of those magical activities that everyone loves, from the nine year olds to the three year old! 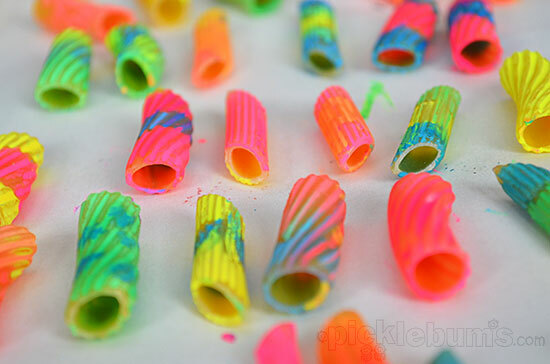 Tubular pasta of any size as long as it can be threaded. Water colour paints – we used these cool fluro tempera blocks given to us by Micador. Water to wash your brush. Art smocks/ Aprons and something to cover your work surface. I set all four kids up on the dining table, dumped some pasta in some bowls and let them lose! The nine year olds painted stripes and fancy colour co-ordinated patterns, the six year old loved the way the paint swam down the ridges on the pasta and swirled the colours together, and the three year old just painted, and painted and painted. You need to be a little light on with the paint so the pasta doesn’t get too soggy, then spread it out and leave it to dry over night. Once the pasta is dry it is time to thread with it! 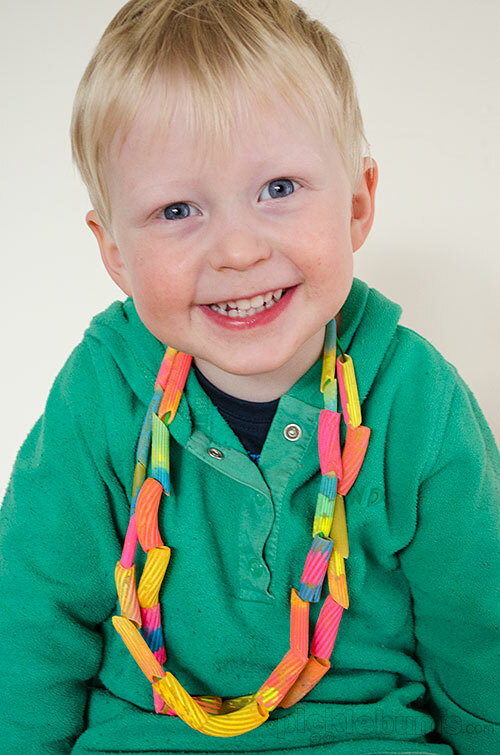 Then just put on your super trendy fluro pasta necklace and you’re ready for anything! 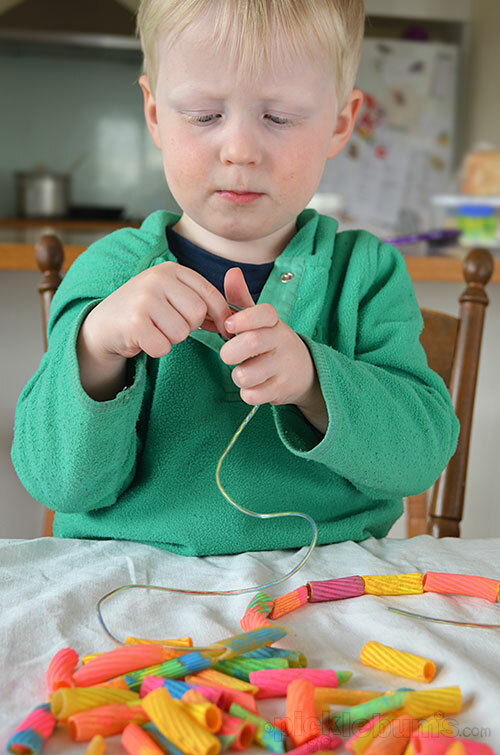 Sometimes it really is the simplest activities that turn out the best. This was so much fun and the results were so cool! I am in love with all the colour combinations and may have snapped 20 gazillion photos of all that glorious colour and then proudly wore my necklace to school pick up! Have you ever worn a kid-made accessory out in public? What a brilliant idea! Can’t wait to use this in my classroom! What crafty little kids you have!!! This is such a great idea! We are totally doing this. Thanks for the inspiration! 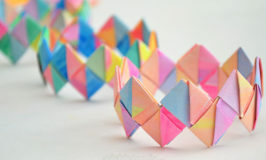 Love, love, love the color of these! I am the same way with pics, I take about a gazillion and then have to narrow it down to just a few….such a difficult task. The color of the necklaces is so “photogenic”! 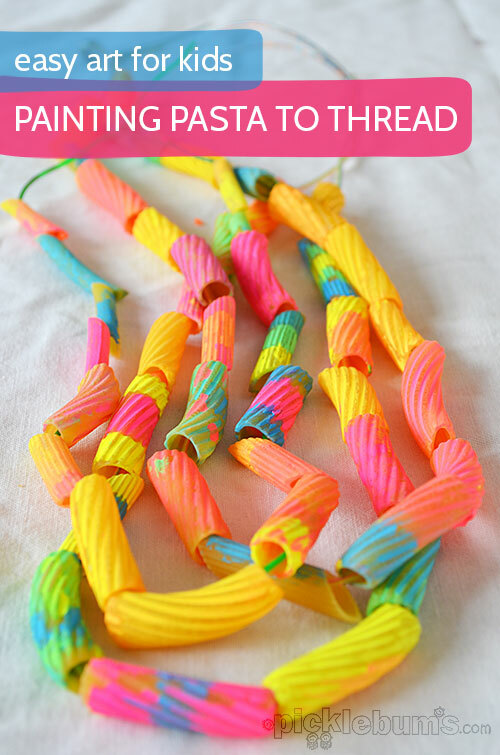 Absolutely love this idea Kate…was just thinking I didn’t have any pasta dyed and the girls really wanted to do some threading….never thought of letting them paint it!! Going to be giving it a go today with some new paints from Micador! Ok, this has made me want to get the tempera paints out! The fluro ones! haha. I can’t believe they turned out so well on pasta! Nice one! Love the colors, questions…will the paint rub off on clothing? Think to spray a sealer on the pasta before threading? And YES, I wear all sorts of child’s art in public! We didn’t have any problem with colour coming off, but it probably would after a while so maybe a quick spray with hair spray would do the trick? Essa ideia é otima! Já fiz com minha turminha na escola, mas primeiro tingi o macarrão com anilina comestivel, assim não corremos o risco das crianças colorarem na boca um produto toxico. Elas adoraram a atividade. 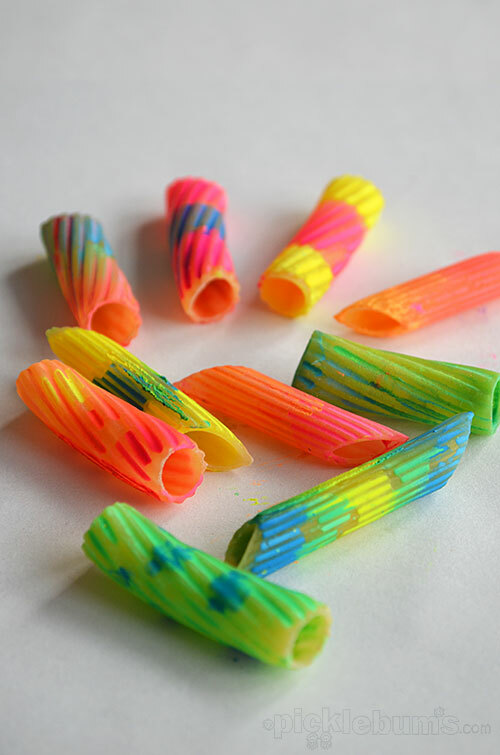 Yes, colouring pasta with food colouring is a great way to get it done quickly, but for this activity the aim was to be creative and to enjoy the process of making fun and funkly coloured pasta to thread. This is such a cool idea. Thank you for sharing.